One of my new favorite magazines is a quarterly called Taproot. It is homestead-y, literary, artsy, sweet, and ad-free. Each issue has a theme, and this winter’s theme was Bread. It got me thinking about all of the breads that have been important to me throughout my life (so far). My grandmother’s sourdough, corn bread, biscuits (a Southern staple), my mother-in-law’s bread, tortillas, and my own manifestations of bread as I feed my husband and growing children. Bread is important and it can tell as story. It can be difficult and surprisingly easy – to make, to understand. And, it can be delicious! The first homemade bread I remember was my grandmother’s sourdough bread. She made two loaves at least once a week, every week, when I was young — and she had done so for many years. That bread had a slight sourness, and a good kick of sweetness (I found out later was from a fair bit of sugar in the recipe). The bread was absolutely delicious warm from the oven – even without butter. I loved peanut butter and jelly sandwiches with that bread. I loved the smell of that bread, and I loved seeing Mom-mom make the bread. Her house would fill with it’s aroma when she was baking and that smell always made me feel at home and happy. I think she got her starter from a cousin in Oregon, and she told me once that she made the best bread of her life when her mother was dying of cancer. She said she put all her anger, frustration, and sadness into the kneading of the dough, and would knead for long periods of time, working it all out. That bread would come out wonderfully light. Mom-mom gave me some of her starter when I was in college and I tried to make bread as a way to link me to some semblance of family life – probably I wanted that feeling that her bread gave me of being at home, loved, and happy. It was hard moving to a city of over 100,000 people (and a dorm of a few hundred), when I’d come from a town of 15,000. I wanted some security, to belong. But, Mom-mom’s starter did not last long. I could not keep it going with the erratic schedule of classes, breaks, and dorm living. I also could not get quite the right result. The taste was right, but the texture and rise were not. Mom-mom never did give me any formal bread baking lessons, as she did for making cakes and cookies. 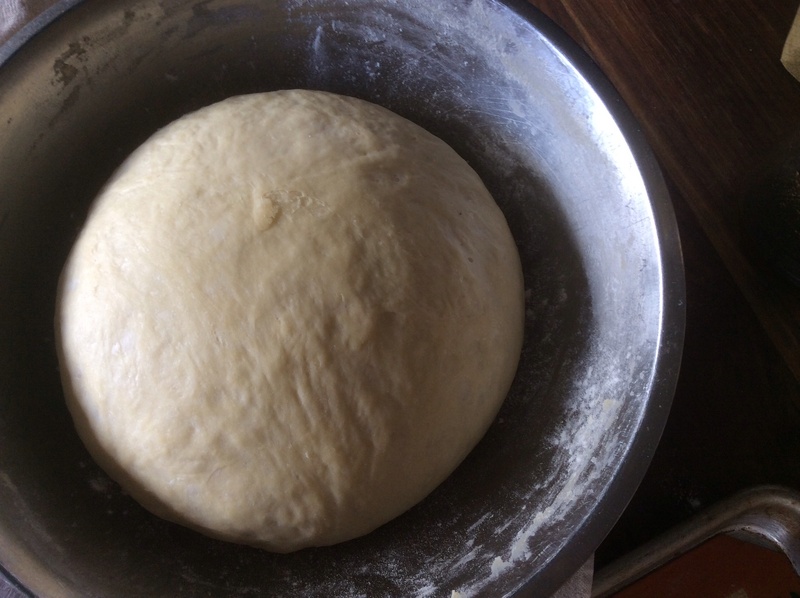 I guess I learned from just watching her work dough through on the counter and shape her loaves to rise – gently laying a wet towel over the bread while they rose. I still use her techniques, even if I don’t use her recipe. That is so sweet. I remember that too. I have never heard the story about working out her anger when Nana was dying. I agree with Phyllis on not knowing that Mother worked out her grief. Susan was born just as Nana was dying and I had my hands full. Thank you fir sharing that. The sour dough starter that mom-mom used came from Aunt Marion. We both got some from her on a visit. I agree with how yummy that bread is fresh from oven …nothing is better ! And I gave some to a friend in richmond and she still bakes bread from it. Aunt Marion liked to say that the starter was over 100 years old….but she some times did not let the truth get in the way of a good story! If you want some starter , I can probably get you some!